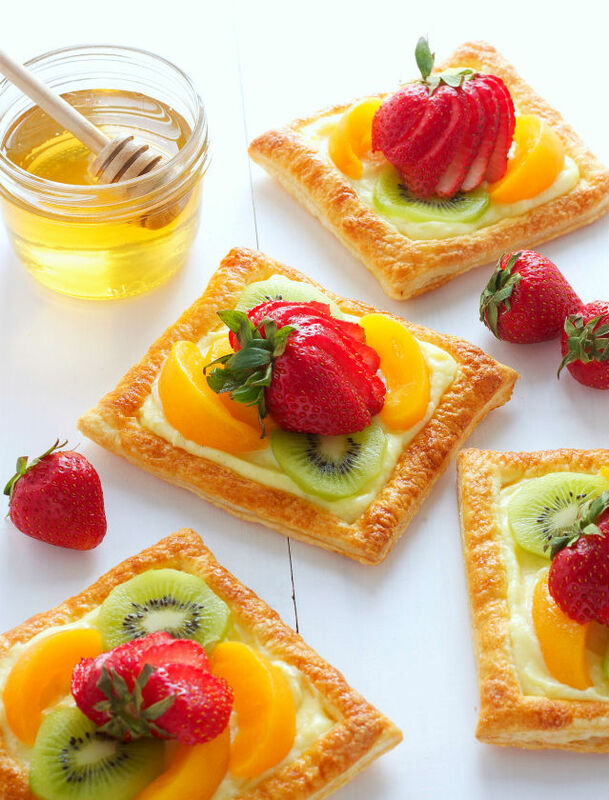 These Honey Glazed Fruit Tarts with Vanilla Bean Custard Filling are a delicious sweet treat for Spring! They display fresh seasonal fruit and a vanilla bean custard with a sweet honey glaze. These tasty tarts are a simple way to impress your brunch guests or your friends at a casual dinner party. Using a pizza cutter (or a pastry cutter), cut the sheet of puff pastry into 4 squares equal in size and shape and arrange them on the prepared baking sheet with ample space between them. Use the pizza cutter again to slice a smaller square inside the larger one, creating a 1.5cm border around the edge of each piece of the puff pastry dough. Be careful not to slice all the way through the dough – just about halfway through the thickness of the dough. Use a fork to dock the inner square of puff pastry dough (poke holes in it). This will prevent the inner square from rising up as much as the outer border will when it’s baking and it will create the perfect shape for the fillings. Beat the egg and the 1 tbsp of water and brush the borders of the puff pastry dough very lightly with this mixture. You’ll have tons of the egg wash left over…don’t overdo it, or you’ll end up with very egg-y edges, and nobody wants that! Sprinkle the borders of the puff pastry dough with the white sugar and bake at 400 degrees Fahrenheit for about 15 minutes, or until the pastries are a light golden brown, especially around the edges. When you take them out of the oven, immediately push down the middle square lightly with the back of a spoon or fork. It will probably have risen up a bit during baking and it’s important that it’s lower than that beautiful border you’ve created. Let the pastries cool to room temperature while you prepare the custard. Open the vanilla bean pod and scrape out the seeds. Add the seeds to a small saucepan with the milk and throw in the whole vanilla bean pod too. Heat the milk and vanilla until it reaches a simmer over medium heat and then remove it from the heat. While the milk is heating, add the egg yolks, the sugar and the cornstarch to a bowl and whisk them together until smooth. Once the milk has reached a simmer, remove the vanilla bean pod and pour the milk extremely slowly into the egg yolk mixture, making sure to whisk continually while adding the milk. This method is called tempering – adding the milk slowly while whisking brings the temperature of the egg mixture up slowly so they don’t scramble. Continue adding the milk slowly until everything is combined. Pour the mixture back into the pot and add it back onto the stove over medium heat, whisking continually until the mixture thickens (this will only take a minute or two). Add the butter to a separate bowl and place a sieve over that bowl. Once the milk/egg mixture has thickened, pour it through the sieve over the butter and press it through with a spatula. You may notice a few small chunks of cooked egg in the sieve – this is totally okay! Grab your whisk and whisk the custard and the butter together just until combined. Cover the mixture with a piece of plastic wrap, making sure the plastic wrap is directly covering the surface of the custard. This may seem like a weird step, but it prevents that yucky custard skin from forming on the surface while it cools. Cool the custard in the fridge for a few hours until it’s completely cool. 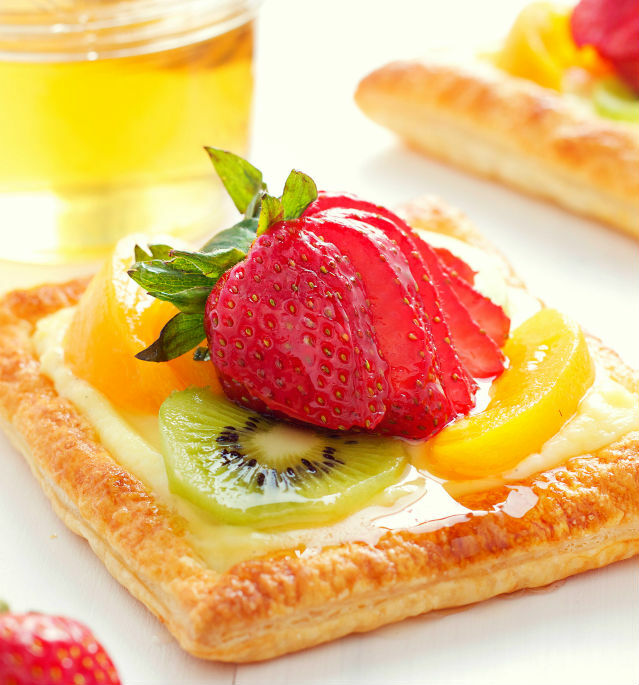 To assemble the tarts, just divide the custard evenly between the 4 puff pastry tart shells you’ve made and spread it smoothly into the base. Add your sliced fruit on top in whatever formation you wish. The great thing about this recipe is that the custard has such a neutral flavor that really any fruit would work! Try blueberries, blackberries and strawberries, or your favorite citrus fruits. Whisk the honey with a few drops of water, just to thin it out a tiny bit. Brush it over the fruit with a pastry brush to create a sweet, shiny glaze!